Are variations in the Sun's brightness an important cause of climate change? Could changes in the Sun's magnetism affect the Earth's clouds? Why do temperature trends in the lower atmosphere give a different impression of global warming from measurements at ground level? The latest results from spacecraft that observe the Sun and the Earth provoke many such questions. They will be debated next week on the Spanish island of Tenerife, where scientists who calculate climate change due to manmade greenhouse gases will meet others who argue that solar effects have been underestimated. The European Union and the European Space Agency are sponsoring the conference entitled "The Solar Cycle and Terrestrial Climate", 24-29 September. It is hosted in Santa Cruz de Tenerife by the Instituto de Astrof�sica de Canarias. More than 40 speakers from 15 countries will review the Sun�s erratic behaviour and its possible climatic effects, in the most comprehensive meeting on this subject for many years. "To those of us who observe it every day, the Sun is a wild beast, and no one doubts that its variations affect the climate to some degree," says Brigitte Schmieder of the Observatoire Paris-Meudon, France, co-chairman of the scientific committee that planned the meeting. "The arguments in Tenerife will be about the mechanisms of the solar influence, and its importance compared with the human factor." Claus Frohlich of the Physikalisch-Meteorologisches Observatorium, Switzerland, will report the latest results from his VIRGO instrument on the ESA-NASA SOHO spacecraft. These show an increase of about 0.1 per cent in visible solar radiation since SOHO was launched in 1995, at the last sunspot minimum. But this is a cyclical variation and comparisons with results from earlier spacecraft show no overall increase since the 1980s. The relatively small variations in the Sun's brightness observed by satellites encouraged the Intergovernmental Panel on Climate Change to propose in 1990 that global warming in the 20th Century was due mainly to carbon dioxide and other heat-trapping greenhouse gases added to the air by human activity. 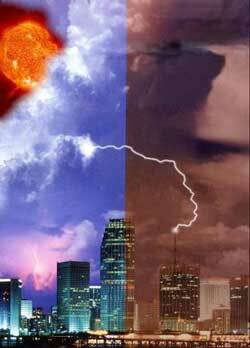 It predicted severe global warming in the 21st Century as a result of this enhanced greenhouse effect. These opinions were reconfirmed in a later report, Climate Change 1995. A third major assessment is now in preparation. Sir John Houghton of the Intergovernmental Panel�s science working group will report at the Tenerife meeting on the issues being addressed. One is a reconsideration of the historical role of other natural agents of climate change, including the Sun. There were no satellites in 1700, when the Sun was unusually inactive and Europe was very chilly, but many experts suppose that solar radiation has intensified since then. Two conference speakers, Marcel Fligge of the ETHZ Institut f�r Astronomie, Switzerland, and Sami Solanki of the Max-Planck-Institut f�r Aeronomie, Germany, have just published estimates that the average visible light increased by 0.2 % during the past 300 years, and ultraviolet rays by 0.7 %. "It requires precise space observations to detect the subtle solar brightening at the peak of the sunspot cycle," Solanki notes. "To evaluate long-term climatic effects, we have to make the most of just two decades of space measurements and use models to reconstruct the larger changes in the past." A discovery made with help from the ESA-NASA Ulysses spacecraft is that the Sun's magnetic field in the Earth's vicinity doubled in strength during the 20th Century. Mike Lockwood of the Rutherford Appleton Laboratory, UK, will discuss this symptom of a more active Sun. It can be used to estimate increases in brightness, which were apparently greater in the first half of the century than in the second half. The intensifying magnetic field, carried by the solar wind, also reduced the number of cosmic rays reaching the Earth from the Galaxy. According to another speaker, Henrik Svensmark of the Danish Space Research Institute, the shortage of cosmic rays reduced the Earth's cloudiness, so enabling the world to warm up. In 1996, Svensmark found that cloudiness gauged from weather satellites such as Meteosat apparently varied according to the intensity of cosmic rays. Using improved data from the International Satellite Cloud Climatology Project, Svensmark and his colleague Nigel Marsh now link cosmic-ray variations chiefly with low clouds over the tropical oceans. Meteorologists have been sceptical about any effect of cosmic rays on cloud formation, but in April this year atmospheric chemists at the University of California, Los Angeles, suggested a mechanism. In clean oceanic air, cosmic rays may facilitate the formation at low altitudes of sulphuric acid particles, on which cloud droplets form. A proposed experiment at CERN, the European particle physics laboratory in Geneva, is intended to test mechanisms like that. Jasper Kirkby from CERN will explain how pulses of particles can simulate cosmic rays, in a purpose-built cloud chamber matching conditions in the atmosphere. Besides the atmospheric and particle physicists, space scientists from the Danish Space Research Institute and the UK�s Rutherford Appleton Laboratory have joined the team for this experiment, called CLOUD. Meanwhile, various combinations of natural influences and manmade emissions have been compared with the sequence of temperature changes of the 20th Century, in a computer model at the Hadley Centre for Climate Prediction and Research, UK. Simon Tett will describe the results at the Tenerife meeting. The warming in the early part of the century is best explained by changes in solar brightness, a scarcity of explosive volcanoes, and internal climate variability. On the other hand, the model indicates that the human influence was the chief cause of recent warming. "The effect of greenhouse gases was masked by the cooling effect of anthropogenic sulphate aerosols until the 1960s," Tett comments. "This allowed the Sun and other natural forcings to play their part in climate change. Now we see the gases beginning to overcome the cooling effects of volcanoes and anthropogenic sulphate aerosols. Since the 1963 eruption of Agung the cooling from volcanic aerosols has offset the small warming from increases in solar irradiance and this cooling has been overwhelmed by warming from greenhouse gases." Another puzzle from the satellites remains. John Christy of the University of Alabama in Huntsville will report that in 1999-2000 the lower atmosphere over the tropics is cooler than at any other time in the past 22 years. He will cite data from US weather satellites that detect temperature-sensitive microwave emissions from oxygen in the air, and independent confirmation by balloon-borne thermometers. "This is curious," Christy says. "According to the climate models used to calculate the enhanced greenhouse effect, the warming should have been particularly rapid in the air over the tropics." Europe will join in the watch on atmospheric temperatures from space, when the first Metop satellite, being developed by ESA for Eumetsat, goes into a polar orbit in 2002. Its instruments will include an advanced microwave sounding unit provided by the USA. The climate conference in Santa Cruz de Tenerife is accompanied by other meetings about the Sun. Sessions organized on 29 September by the Joint Organization for Solar Observations will review data handling, instruments, and the August 1999 solar eclipse. On 30 September, the European Solar Magnetometry Network will convene. In the following week, 2-6 October 2000, helioseismologists of SOHO and the ground-based GONG project will gather for a workshop on "Helio- and Asteroseismology at the Dawn of the Millennium". Paal Brekke of ESA will give a popular talk on "The Sun through the eyes of SOHO" on 29 September at 20:00 in the Cajacanarias Conference Center. ESA will publish the proceedings of "The Solar Cycle and Terrestrial Climate" conference in a few months' time.